Since it is ArtRocks' 15th anniversary, I thought it would be appropriate to tell you all a little history! Fifteen years ago, I saw a painting of a cat on a stone by a Gimli artist. I thought, "Wow, you can do real art on a rock!" This concept was foreign and exciting to me, as I had been looking for a new medium to work with. So, I got to work and painted my first rock, with help from a book by Lin Wellford. The result is the little fox below. I remember feeling such satisfaction from painting this stone—I was impressed with my first effort and felt a real connection with the art form. I also remember that I thought I would never get used to manipulating a paintbrush the way that I could use a pencil! But, I still wanted to paint another right away. That same year I did my first craft sale in Gimli. 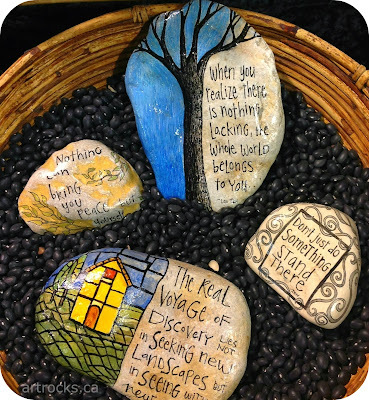 It was about 10 years ago when I began putting quotations and other words on stones. I recalled how my son had once handed me a stone that he had written "I love you" on while I was working (how's that for cute)! This was my inspiration for my use of quotes on rocks. I had collected sayings for years and my love of words, lettering, and design began to seep and mingle with my love of nature. Since I started ArtRocks, I have also been able to go back to my roots by working with paper and other mediums, which I did when I was younger and in school. I used to create many pencil portraits on paper in my 20s, and only a couple years ago I began to try portraiture on stones. Even though I've branched out, I am still so happy to be working on stones. The process of selecting the stones on day trips to the lake shores, the decisions of what will go on the stones, and the execution of the images are all such big parts of my life that I can't imagine what I would do without them! And believe me, I never imagined this when I was in art school! I've learned why it is so important to always try new things because you never know where it will take you! Next week, I'll talk about my paper line and new art projects.